I had always been a fan of indoor cycling classes, but I was resistant to trying SoulCycle. I thought, how different could it be? I finally gave in when a friend visiting the Bay area from Chicago convinced me to join her for a class. It helped that I was also in the middle of a weight loss challenge with some family members and I needed something to help get me across the finish line! Because I am a rooster by nature, I took my first ride at 7:00 AM on a Monday! I know everyone says it, but I will never forget that first class. Everything from the music to the instructor (Molli S., whom I immediately clicked with!) 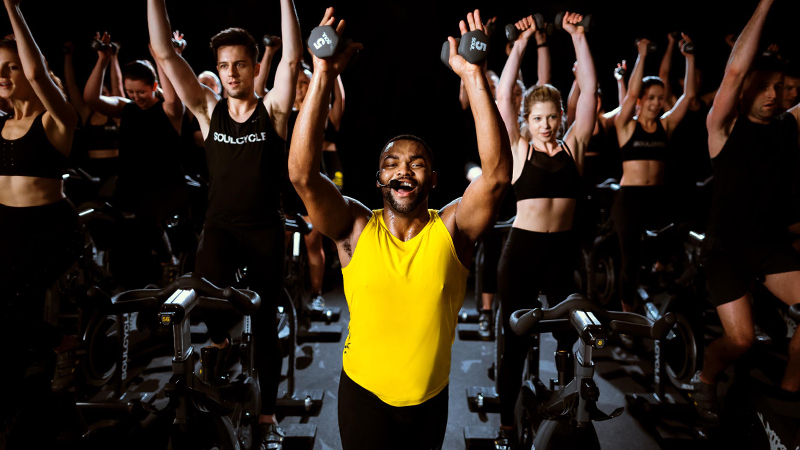 to the positive mantras I heard throughout class to the darkness of the room to the goosebumps I got during the song after weights signaled to me that I would soon be addicted to SoulCycle… in a good way! To put it simply, the feeling that SoulCycle gave me kept me coming back. 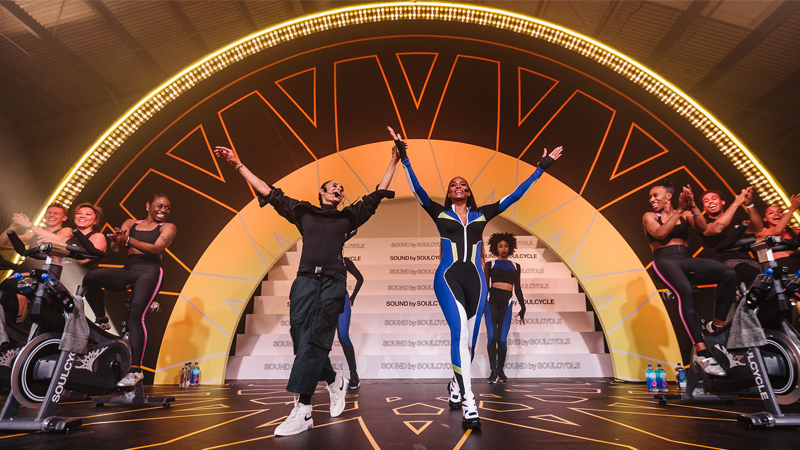 Although there were many times in class I thought I could never catch the beat, there was a confidence that SoulCycle gave me that someday I would (and sometimes I do!). It inspired the feeling that no one was watching me, and that I was in control of my effort, and also gave me a feeling that I was being supported by the other riders and the instructor. The music was also a big part of what kept me coming back… listening to an awesome playlist for 45 minutes almost made me forget about that fact that I was exercising! How has SOUL impacted you emotionally? I often refer to SOUL not as an exercise but as my therapy. It is the only place where I can actually turn off my brain (most of the time at least) and forget about the stresses of work and life. I am constantly reminded that I am lucky to participate in these classes — and that really helps me to put everything into perspective. It gives me confidence that I can conquer all challenges that come my way… if I can survive 45 minutes of SOUL, most other challenges are insignificant. Nice! Has clipping in influenced you in any other ways? The impact on my body has been positive, of course, but it was at SOUL where I realized that it’s not what my body looks like on the outside that gets me through class, but it's the strength I have on the inside. (I wish I could remember which instructor it was that I heard that from first!). 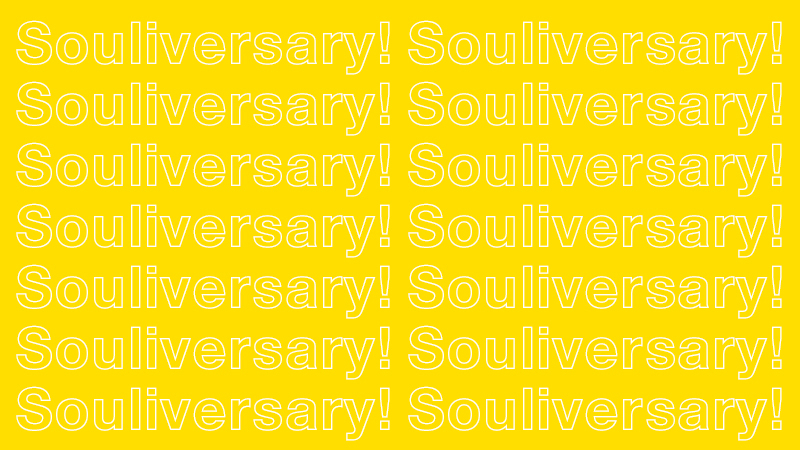 It’s ironic that one of the driving factors that brought me to SOUL was my desire to lose weight. Now I couldn’t imagine weighing myself because it’s how I feel that matters — and a number shouldn’t dictate that feeling. You rocked 150 rides in 2016. What made you make that resolution? For someone who has worked in advertising for many years, it’s funny that it was a marketing message that led me to making my goal of 150 rides. At the beginning of 2016, there was a social media campaign asking riders what their reSOULution would be for the year. Just like that, I decided I was going to take 100 classes. After taking 13 classes in January, though, I knew that goal was too easy and I was capable of at least 50 more. So was the goal of 150 classes ultimately easy or difficult to keep? Because I enjoy SOUL so much, I have to say it was not terribly difficult for me to reach that goal. Additionally I made myself accountable by announcing my goal to friends and followers on Facebook and even creating an Instagram account dedicated to my journey (@stefcycles150 if you want to check it out!). Sure, there were days that it was hard to get to the studio and months where business travel kept me away for weeks at a time, but knowing that others would want to know if I achieved my goal kept me going. Knowing how I would feel the end of each and every class kept me coming back. That’s amazing! Did anything in particular keep you motivated during those tough days? 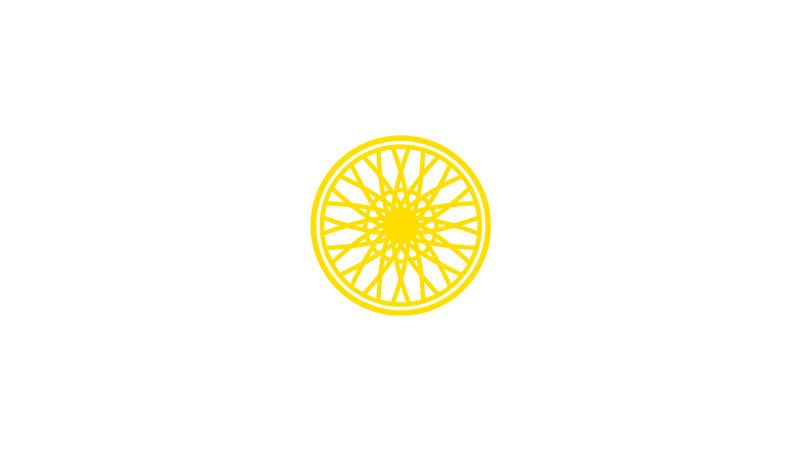 I give the SoulCycle community and my support circle all the credit for my motivation to achieve my goal. As more instructors heard about my goal, they would give me shout-outs in class…. "Little old ME!? !” I always thought… and good thing the room was dark so you couldn’t see how red my face would get each time. A HUGE credit goes to instructors Molli Surowiec and MK Hurlbutt: I literally can’t put into words how much they have supported and motivated me in the past year. They will always be a part of my SOUL journey and I can’t thank them enough. The SOMA staff members (my home studio) were also huge motivators. They were always asking me what class I was on and helping to celebrate each milestone along the way… I seriously couldn’t ask for a better home studio! I felt supported an encouraged by every fellow rider who gave me a hoot or a holler when my goal was announced in class. SOUL people are absolutely the best people! Do you have any particular rides or memories at SOUL that stand out to you? I have SO many! I will never forget the first time I rode in the front row for my 50th class. I was back row for life and never imagined myself in the front keeping the pace for other riders. Because of all the support and encouragement I had received thus far, I felt like there was no way I could fail. I know it’s not a big deal to some people, but for someone who was always in the back, it was a HUGE deal. During class I feel like I might have had an out-of-body experience, but I survived! That IS a big deal — congrats! 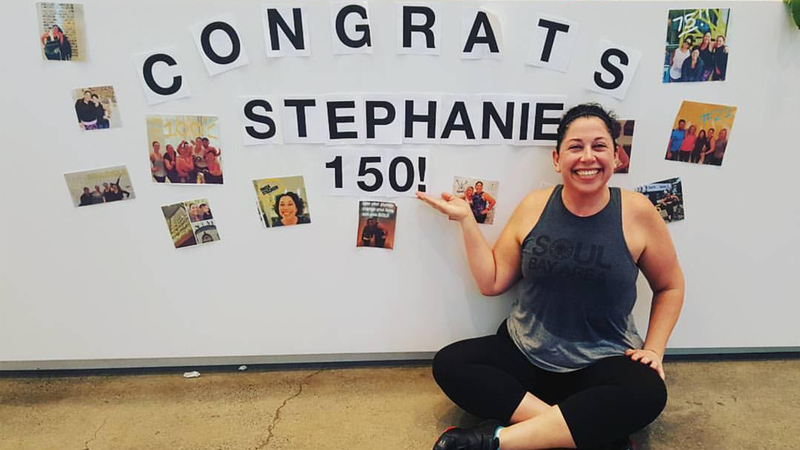 There were many others, too — the first time I doubled, riding in NYC, Chicago and Boston for the first time, my first 60-minute Survivor class, when a total stranger asked me which class number I was on… the list goes on and on! Those all sound like incredible memories with the pack. They are! But obviously ride number 150 was one of the best memories. There were so many people in the room who started off as fellow riders and now had become friends. There was an amazing playlist and encouraging words from Molli S. (whom I often refer to as my “music spirit animal”). I was in the front row again and seriously have never in myself felt stronger. The staff even decorated the front desk with a sign for me! I felt so special! We’re sure that was an inspiring ride for you and everyone else in the studio, too. My motivation behind setting the goal of 150 classes was by no means for the recognition that I have so very humbly received. I know there are many other riders completing far more classes each year, and they are the ones that inspire me to keep going. Whether you complete 1 class or 1000, it should be considered an accomplishment and the SOUL community celebrates just that! We are so glad you shared your story with us! Last but not least, we all know you’re a total bada**, but what word in the SOUL mantra do you think best describes yourself? I think I identify most with warrior, mostly because I just keep going and don’t let anything (mostly myself!) get in the way.